The Survival rapper will take to the stage at the US event in August, according to the Chicago Tribune. While the line-up is not officially revealed until later this month, the paper said industry sources have confirmed the news. Skrillex, Kings Of Leon and Arctic Monkeys have also been named as headliners for the festival. All four acts have previously performed at Lollapalooza, although this will be Arctic Monkeys' first headlining slot. 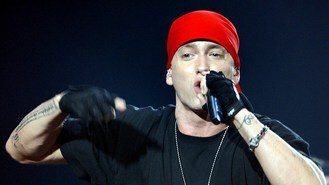 Eminem last had top billing at the event in 2011. This year's festival takes place from August 1-3 in Chicago's Grant Park and will see more than 100 music acts perform across eight stages.